A press release announcing that astronaut Gordon Cooper (1927-2004) was at the General Dynamics/Astronautics plant in San Diego, California, to inspect the Atlas rocket that would carry his Mercury mission into orbit. Also in attendance was Dr. Cal Fowler (1929-2013), who was the Launch Complex 14 manager and launch conductor at Cape Canaveral Air Force Station (CCAFS) in Cape Canaveral, Florida. The press release noted that Cooper was the first Mercury-Atlas astronaut to inspect the vehicle at the plant. Cooper would later ride the Mercury-Atlas vehicle into orbit on May 15, 1963, and circle the Earth 22 and a half times. Original 1-page typewritten press release, May 1963: Private Collection of Dr. Calvin D. Fowler. 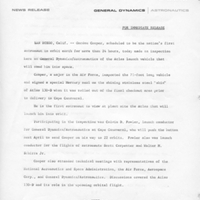 Digital reproduction of original 1-page typewritten press release, May 1963. “Mercury-Atlas Press Release.” RICHES of Central Florida accessed April 22, 2019, https://richesmi.cah.ucf.edu/omeka/items/show/6407.